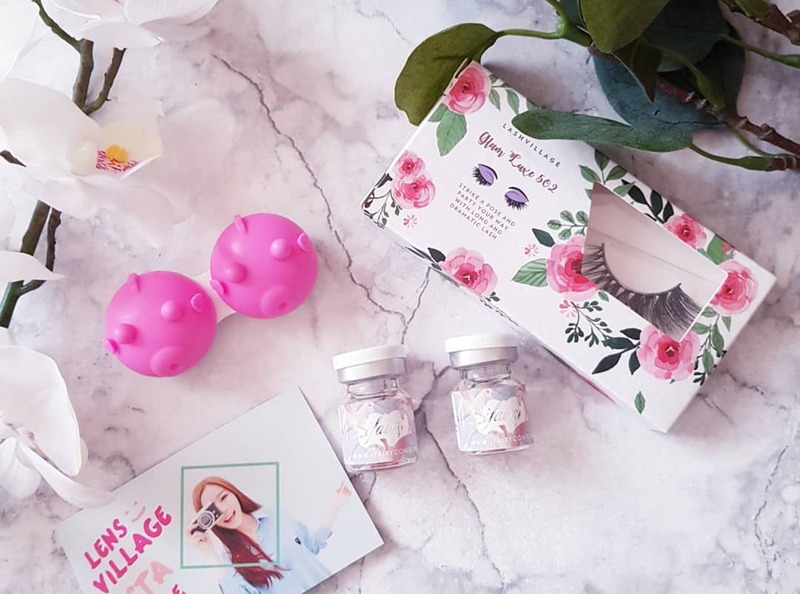 This time around I'm reviewing a pair of contact lenses and a pair of false lashes from Lensvillage.com! I needed new red lenses, so it was very quick for me to decide upon these. They are a really beautiful and vibrant red, with several tones in them for dimention. Once on the eye, they become slightly more purple, which is very common on my bright blue eyes. I'm still very happy with how vibrant the colour is. Contact lenses in their case. Contact lenses on my eyes in different lightning. Full face photo of me wearing the contact lenses. 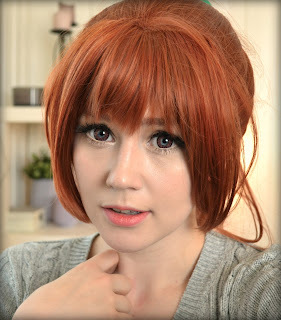 I generally don't want my circle lens to cover too much of my actual eye, so this is not a bad thing. My eyes aren't huge, and I generally just want my own eye colour to be covered! These are very comfortable. My eyes are quite used to wearing lenses, but recently I've experienced alot of dryeness. I wore this lenses for a solid 7 hours the first time I used them, and I experienced no discomfort what so ever. I did experience dryness after removing them later on that day, but that happens to me with normal daily contact lenses too. As mentioned above, I loved how bright and vibrant the red is! And it still goes strong on top of my blue! 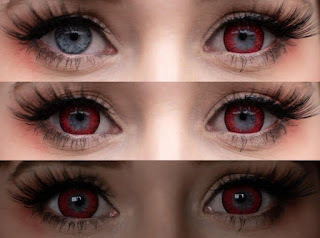 I can definitely reccommend these for blue eyes such as mine. Even though you can see my natural blue through the pupil, the blend towards the pupil isn't terrible. I've seen better, but it's not bad! I might also have wanted a little more darker patterns for more depth, but all over the design looks quite natural as far as red eyes are concerned, haha! First of all I just wanna say, these lashes are SO AFFORDABLE! You also get a discount on them when you buy lenses! Okay, these lashes are REALLY comfortable. They are really lightweight for how full and glam they are! The lashband is very thin and flexible, so it makes it really easy to apply them in my opinion. The design is also something I like VERY much. They are so full and they really live up to being both GLAM and LUXE! They were so long it was almost too much for me since I have such little eyelid space. Still love them tho! My only "complaint" is also something I kind of like. They are very long, so I imagine they will fit just about any eye size, you could just cut them as much as you'd like. I cut mine at the outer end, which I do with most lashes. That however means you lose some volume unless you glue the cut offs onto the lash again for the full volume. You could cut them from the inner corner too, but that again might mean too much volume. But honestly, this isn't an issue, this is personal preference! My conclution is that these contact lenses and lashes are well worth picking up! Overall I'm so happy with these products! You can also get a 15% discount on some for yourself using the code 15TANZOIR on checkout! I.fairy (store.ifairycon.com/) recently sponsored me with another pair of contact lenses, and today I want to review these for you! Before we start on the main review, I just want to say that the people at I.fairy are so sweet, helpful and friendly. They get back to you so quickly, and my experience with them is nothing but the best! This time around I decided upon the colour called Sweet Ruby. They are a beautiful mix between brown, reds and a slight pink. As always, the contactlenses came in the mail very quickly (10 days, and they actually had holidays coming up. Very impressed. ), with a prescription at -2.50 on both eyes. I generally don't want my circle lens to cover too much of my actual eye, as there is a fine line between "anime eyes" and "ghoul". These contact lenses got that covered. Anime eyes 101. I believe I wrote this in my first review of the I-Codi contact lenses; I've NEVER worn more comfortable contact lenses in my entire life. I secretly want to get contact lenses in EVERY single colour they have and use nothing but those the rest of my life, hahah. I generally don't have many issues with my eyes, but I usually end up with sore eyes at the 3rd day of the convention. Not with these! The colour Sweet Ruby is as mentioned above, a really sweet blend between browns, reds and pink. They colours are very well balanced. When I put them over my blue eyes, they get a slightly more violet tone, but can by no means be called violet. Even though you can see my natural blue through the pupil, as always with the I-Codi colors of the wind contact lenses, they blend very nice. And I tell you what, that's not always the case when you have light coloured eyes naturally. The design very much resembles the natural patterns that occur in human eyes, and by using the colours the way they have, they appear to have real depth! My conclution is that these contact lenses are among the best I've ever had, and that I actually want every single colour of the I-codi colors of the wind contact lenses. Thankyou to I.fairy (store.ifairycon.com/) for letting me try their contact lenses once again. Last but not least, if you're interested in trying their contact lenses (which I highly reccommend that you do), you can use the discount code TANZOIR15 for 15% off on your purchase! This product is sadly out of production. 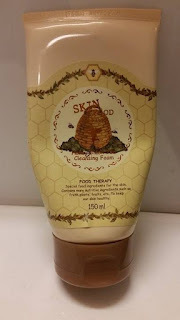 Today I will be reviewing Skinfood Honey Black Tea Cleansing Foam cleanser. This is the facial cleanser I have been using for the last 8 months. I can by now definitely say it's the best cleanser I have ever used, and I will most definitely keep using this in the future as well. Before we start on the review, I'd like to point out that I have combination skin (oily t-zone and dry cheeks), that's also sensitive. My main problem areas has been eczema, large pores, and dehydration. I bought this cleanser because I needed a new one, and at the time I was (and still am) deep into k-beauty. Skinfood was a brand I had heard of before even getting into the world of korean products, and looking through their webpage, I found this guy. I love honey, I love tea, I need a new cleanser. 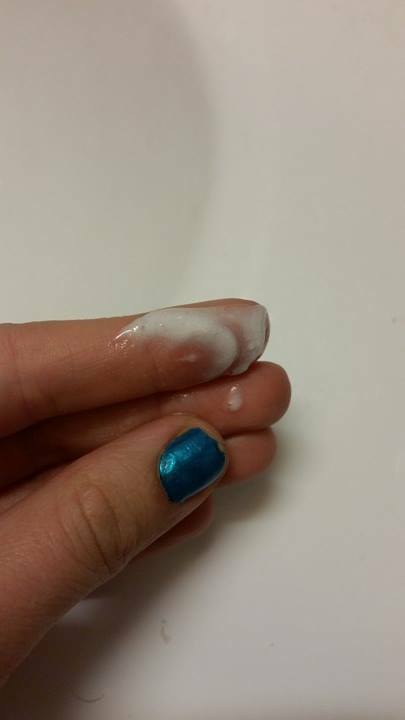 After some googling, I learned that this was supposed to be geantle to your skin while cleaning it properly. The cleanser in all it's glory. Almost empty. How to use: Dispense an ample amount into wet palm and lather up. Rub face gently and rinse with lukewarm water. Splash on cold water for astringent effects. Consistency: In many ways this is very creamy, until you foam it up between your hands. It's not the type that foams up much, but rather just enough to be called a foam cleanser. Skinfood's webpage calls it a high density foam. Consistency up close, before foaming it up. Smell: The scent is one of the things I like the most about this product. It actually smells like black tea with a little bit of honey in it. Both of them are there, but it's not dominating! It also smells really quite clean. Definitely not overpowering, so even if you're sensitive to strong scents, I don't think this will be too much for you. This tube is 150ml, and I just want to point out that a little goes a looong way! Me, on my own, have one of these for two, maybe two and a half month, cleasing my face morning and night. Another thing I want to mention, is that I rarely use this to take of my makeup. If I wear any makeup, I will go in with an oilcleanser prior to this cleanser. So I can't tell you it will take off your makeup for you, but for a 2nd cleanser, this guy does the job. Or on a daily basis for people like me, that don't wear makeup every day. My experience, and also conclution for this product, is that it is absolutely amazing. My face feels so clean after use, without being that squeaky clean, stripped for oils kind of clean. With the 2 step cleansing routine I use, I don't find any traces of makeup, dirt or grime leftover on cottonpads after. And if you need further convincing, my boyfriend also uses this, haha! It's a perfect, sensitive everyday cleanser for the both of us. I buy my korean beauty products on ebay. Make sure you find a trustworthy seller, or use pages like testerkorea or roseroseshop. The last few months I've been getting into Asian skincare, especially Korean. I've had a passion for makeup for as long as I can remember, but only really got into skincare when I was 18. I went to Japan as an exchange student, and after going through stress and pollution there (I come from clean norwegian forests, ahahah), my skin became pretty bad. A lot of pimples, blackheads and in general just really bad skin. Looking back, I can definitely say that it was mostly hormonal breakouts (lots of breakouts on chin and lower cheeks) but also from pollution etc. Coming back to Norway, I was rather desperate to get my skin back on track. I ended up trying quite a lot of different products, from both farmacies, alternative health stores, drugstores etc. The Body Shop's products was actually what worked for me, and got my skin back to a condition where I wasn't embarrassed about it anymore. It also got me interested in taking care of my skin. Lately I've seen that I'm not gonna stay young forever (tiny crowsfeet, smile wrinkles, I'm talking about you). So I felt like I needed to up my game a tad. A friend introduced me to the wonders of korean cosmetics, and Asian Beauty. So I figured, I'd try it out. For you who are new to the whole Korean skincare routine, I'll break it down for you. Koreans seem to believe in a routine with several steps (some have up to 13 products in their routines, I'm at 7 atm), and each step is supposed to target certain problems/areas. They're also firm believers in suncreen and oilcleansers. And snails. Hahah. Before you get intimidated by the many steps to a korean skincare routine, let me just say that I use a maximum of 15 minutes every morning on my 7 steps. They're not as time consuming as they might seem, and I'm quite enjoying the extra me-time. And the effects on my skin! I'm in a very stressful period of my life atm, and I'm barely even breaking out. I think I can count all the pimples I've had since August on two hands. I have now, since August, tested out a tiny amount of products, and some of them are probably gonna stay with me for life, that's how much I love them. Before we continue, I just wanna say a few things about my skin, and what I think my problems are. I have combination skin, with an oily t-zone and dryer cheeks. I have big pores, with some blackheads on the tip of my nose. I also have very sensitive skin, which haven't made my search for products through my 24 years of life an easy job. But I have not actually reacted to a single korean product I've put on my face so far. Anyways, starting with building myself a routine, I had a few areas I wanted to target. I wanted cleaner pores/clearer skin. Anti age. Stop the crowsfeet from evolving. Prevent smilelines, stuff like that. I also wanted something to calm my skin a bit. 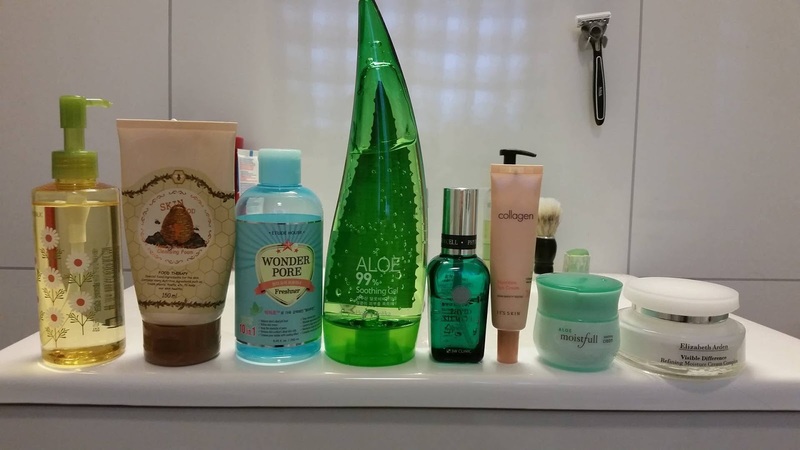 Here is a litte view of my skinroutine, missing a few products to be complete (a booster and a scrub). Also, I don't use the oilcleanser every single night, only really on makeup days. 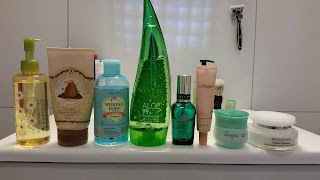 From left to right: Nature Republic chamomile cleansing oil, Skinfood honey black tea cleansing foam, Etude House wonder pore freshner toner, Holika Holika 99% Aloe, 3w clinic phyto stemcell essence, It's skin collagen eyecream, Etude House aloe moistfull soothing cream, Elizabeth Arden Visible Difference Refining Moisture Cream Complex. I will definitely get around to writing about some of the products I've fallen for so far, as I need the world to know about them, hahah. Stay tuned for some proper reviews! 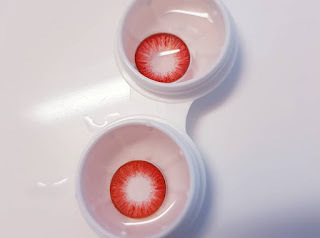 Recently I.fairy (store.ifairycon.com/) gave me the chance to try out a pair of their contact lenses, and this will be a review of the lenses I got! 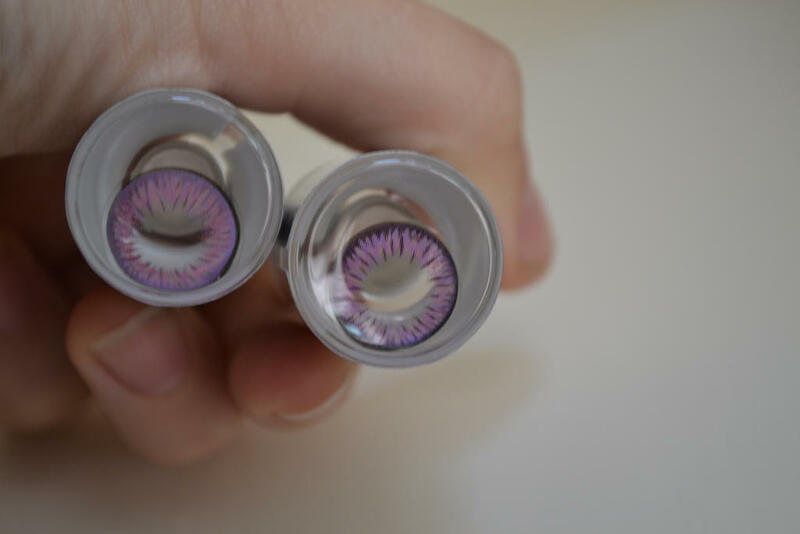 I had been looking for a set of purple/violet contact lenses to fit some of my upcoming cosplays. My choice landed on Milk Liliac. I.fairy worked very fast, and within 10 days I had a brand new pair of contact lenses in my hands. They're also supereasy to communicate with, and very helpful. They also provide prescription strenght, for us with less than perfect eyesight. I'm -2.50 on both eyes, and got them in that strenght exactly. This is what the contact lenses looked like in their original packing. .Before and after contact lenses. 2.Natural daylight. 3.Indoors with flash. Full face photo wearing the contact lenses. I didn't actually expect them to enlargen my eyes all that much when I first saw them in their cases, but once I got them on my eyes, I was plesantly suprised! They made my eyes look a fair bit bigger, but not in an unatural way. I pretty much never have problems with contact lenses, as my eyes are pretty tough. Even so, I can still feel the difference between contact lenses, and these lenses were very comfortable! They felt like ordinary contact lenses, or actually, even better. They're supersoft and hydrated my eyes very well. The color I chose, Milk Liliac, is amazing. I wanted a ligther violet that would match my real eyecolour nicely. And they really did! I'm so happy with how it blends, and how soft the color is. 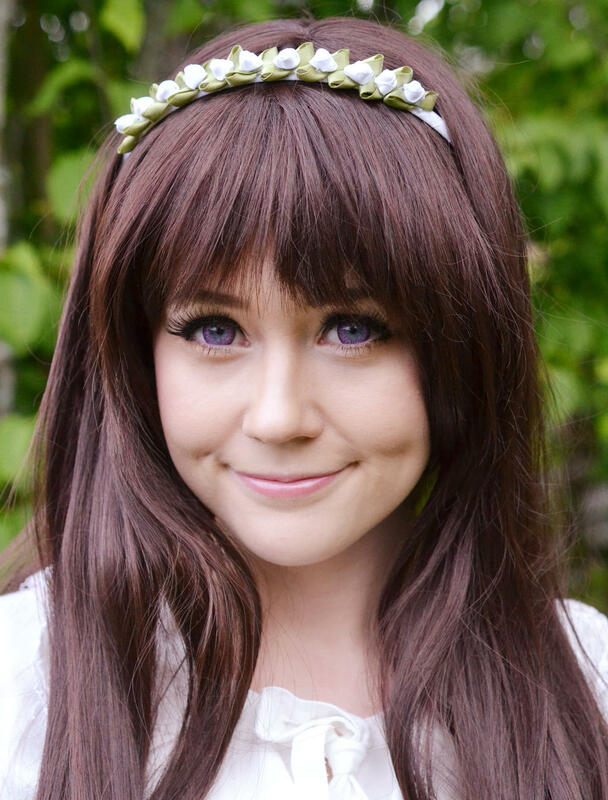 Even for violet lenses they look quite natural. The design, as I've mentioned earlier, is very natural, but not in a bland way. The darker ring around iris makes your eyes pop, and it blends with the rest of the design nicely. It has natural specks of darker colours, which gives it that natural looking depth. All in all I'm so very very happy with these lenses! Having light eyes can be very challenging as far as contact lenses are concerned. Always worrying if my blue eyecolor will show through or if it will cover properly. I did not find this a problem with these contact lenses at all. They fit my eyes incredibly well, and has made me want to get more I-Codi lenses in the future. Fantastisk AS-tema. Temabilder: sololos. Drevet av Blogger.